OUR NATION’S capital, Kuala Lumpur, takes centrestage in a unique new publication that is the brainchild of local writers Zikri Rahman, Nurul Aizam and Ridhwan Saidi. LiteraCity: Kuala Lumpur Literary Fragments is their attempt to depict the city through the lens of Malaysian literature, focusing on novels, short stories, poems and plays. “We hope that the book will excite readers to hold open discussions about [the nature of] our city,” Zikri says. Zikri was the one who came up with the idea, and Ridhwan and Nurul joined him on the project, which took about a year to complete. Both Ridhwan and Zikri contributed their own essays to the book. 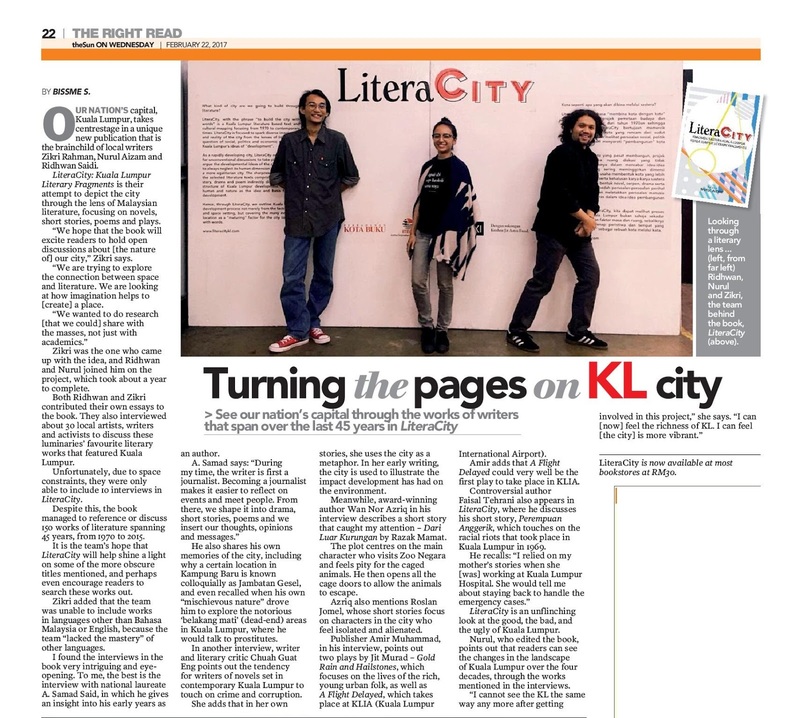 They also interviewed about 30 local artists, writers and activists to discuss these luminaries’ favourite literary works that featured Kuala Lumpur. Unfortunately, due to space constraints, they were only able to include 10 interviews in LiteraCity. Despite this, the book managed to reference or discuss 150 works of literature spanning 45 years, from 1970 to 2015. It is the team’s hope that LiteraCity will help shine a light on some of the more obscure titles mentioned, and perhaps even encourage readers to search these works out. Zikri added that the team was unable to include works in languages other than Bahasa Malaysia or English, because the team “lacked the mastery” of other languages. I found the interviews in the book very intriguing and eyeopening. To me, the best is the interview with national laureate A. Samad Said, in which he gives an insight into his early years as an author. He also shares his own memories of the city, including why a certain location in Kampung Baru is known colloquially as Jambatan Gesel, and even recalled when his own “mischievous nature” drove him to explore the notorious ‘belakang mati’ (dead-end) areas in Kuala Lumpur, where he would talk to prostitutes. In another interview, writer and literary critic Chuah Guat Eng points out the tendency for writers of novels set in contemporary Kuala Lumpur to touch on crime and co rruption. She adds that in her own stories, she uses the city as a metaphor. In her early writing, the city is used to illustrate the impact development has had on the environment. Meanwhile, award-winning author Wan Nor Azriq in his interview describes a short story that caught my attention – Dari Luar Kurungan by Razak Mamat. The plot centres on the main character who visits Zoo Negara and feels pity for the caged animals. He then opens all the cage doors to allow the animals to escape. Azriq also mentions Roslan Jomel, whose short stories focus on characters in the city who feel isolated and alienated. Publisher Amir Muhammad, in his interview, points out two plays by Jit Murad – Gold Rain and Hailstones, which focuses on the lives of the rich, young urban folk, as well as A Flight Delayed, which takes place at KLIA (Kuala Lumpur International Airport). Amir adds that A Flight Delayed could very well be the first play to take place in KLIA. LiteraCity is an unflinching look at the good, the bad, and the ugly of Kuala Lumpur. Nurul, who edited the book, points out that readers can see the changes in the landscape of Kuala Lumpur over the four decades, through the works mentioned in the interviews. “I cannot see the KL the same way any more after getting involved in this project,” she says. Footnote : LiteraCity is now available at most bookstores at RM30.